Each ColdTrack vial has a unique RFID tag embedded in its base. The RFID tag can survive freezing down to -200 ºC and heating up to 134 ºC (the maximum temperature rating of the vial) without loss of functionality or data. The RFID tag is integrated into the vial - it cannot be removed, or fall off, inadvertently. Each vial has a unique identifier that is not shared by any other vial. Sample data (microscopy images, DNA sequences, test results, patient data, etc.) is stored in the LIMS database and not in the vial itself. An optional backup identifier in the form of a pre-inscribed 2D Data Matrix barcode is available (shown in the center vial in the image). 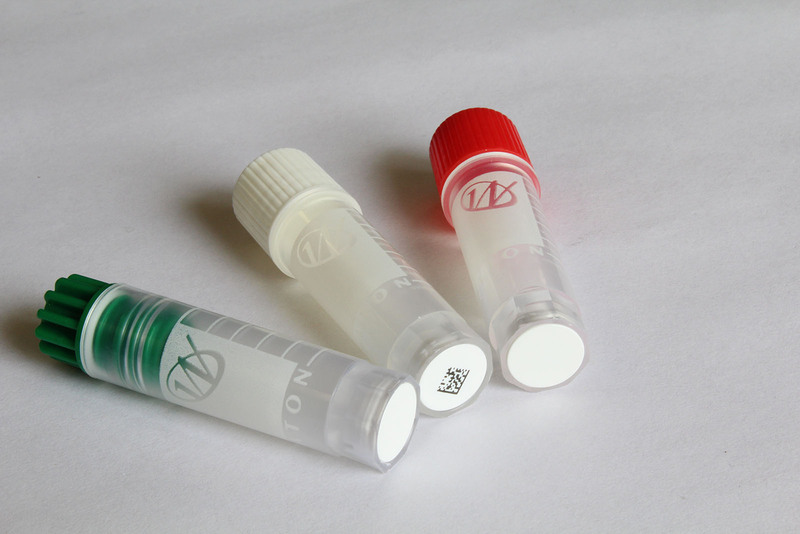 RFID Inserts can be purchased separately and attached to Wheaton's CryoElite vials purchased through us or from other suppliers. All tags are programed with unique IDs and are 100% tested. The RFID inserts can be shipped with or without 2D DataMatrix barcodes. Ethylene oxide sterilized vials are also available. Inserts are shipped in units of 1000 RFID inserts (2 shown here).